I honestly do not think I have ever had a 3am alarm call before, why would I? To be honest I could probably quite happily never have one again to be honest. However, as this was all aid of sun seeking as the clock hit 3am and Taylor Swift started to sing her little heart out to me, I could quite happily throw myself out of bed, put on my makeup and my trusty Primark holiday hat and walk the 30 second distance between the Hampton Hotel Liverpool Airport and the airport for my flight to Naples. I would definitely recommend the Hampton for anyone looking for an overnight stay before their flight, the rooms were modern, crisp & clean, the bathroom was amazing and I actually think it was nicer than some of the Hilton’s I have stayed in, despite being branded as the more budget option in the family! We even managed breakfast before checking out! 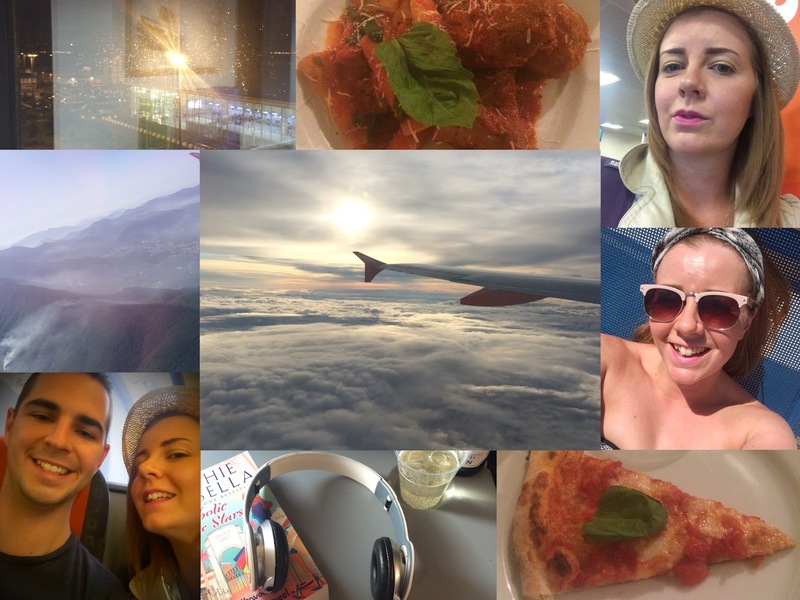 Flying with EasyJet was a complete doddle; we checked in online a few days before our departure date, chose our seats and downloaded our boarding passes to my iPhone meaning there was no paperwork to remember. So on arrival at the airport all we had to do was drop the case (19.9kg, phew) and being a 6.20am flight there was little chance of a delay (in fact we took off early) so after a quick walk around duty free, a bit of spending and a quick coffee we were in the air and then safely on the ground in Naples by 10am. On our arrival at Napoli Capodochino we headed outside, following the signs for the shuttle to the rental car pick up. However, all we found was a very long queue and no sign of a shuttle. So Paul took control of to suitcase, had a quick look at the map and off we we went in search of the pick up spot. 10 minutes and 3 blisters later we found the giant car park that was the pickup point and after picking up our car from Sicily by Car, we made the short journey down the coast towards Sorrento. Our base for the week was the Grand Hotel La Pace was situated few kilometres outside of Sorrento itself in Sant’Agnello. As the name suggests the hotel itself is very grand and ornate in style and it almost felt as though we were stepping back in time to a glamorous period that time itself has forgotten about in the hype and splendour of modern day. I could easily see this hotel playing a part in a Sean Connery Bond film! After being greeted with a glass of something sweet on our arrival we were shown to our room by the hotel’s Hostess. Situated on the second floor behind the solarium block, we had a gorgeous king size room with plenty of space and a terrace that caught the sun most of the day. By now although it was only about 12pm, my stomach was talking to me and so after dropping our bags and changing into our swimwear we took in lunch (our first Pizza & Peroni of the week) at the poolside bar before lounging for the rest of the afternoon poolside. That evening we headed into Sorrento using the free shuttle at the hotel and had a wonder around before heading to La Basillica for tea. Hidden away down a side alley between the main Piazza and the seafront, La Basillica offers a range of traditional Mediterranean dishes at very reasonable rates and you can choose whether to din inside the fiery, Vesuvius inspired restaurant or on the more informal, romantic terrace. We chose the terrace and as we were both quite tired by this point we opted to take in just one course (although we were treated to a taste of their amazing Pizza too) and whilst I opted for a traditional Ragout, Paul chose a fillet steak that was cooked to perfection. After tea we simply headed straight back to the hotel, our eyes barely open after being awake for 21 hours at this point. Before leaving the UK I did my research on the hotel on Trip Advisor and notice the only negative remarks were the distance from the hotel to Sorrento. It’s a mile an half, easily walkable and giving you the opportunity to burn off some of those carbs you will have been eating. But maybe not when you’re as tired as we were!